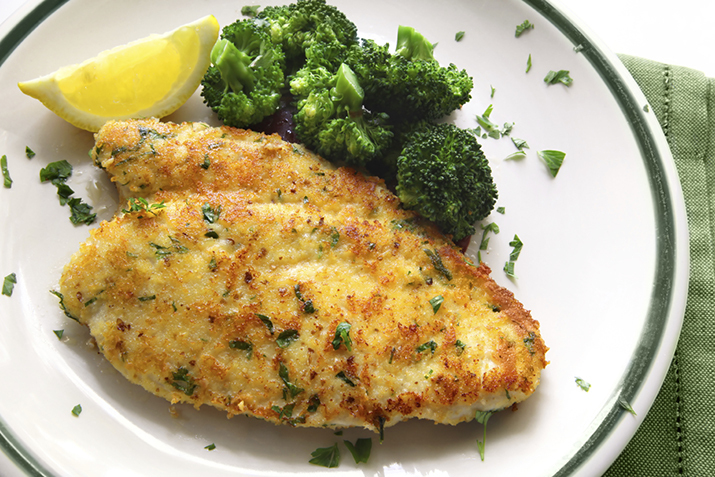 A tasty Parmesan crust dresses up ordinary chicken. This quick and easy main dish is one the whole family will enjoy. In a shallow dish, combine flour, Parmesan cheese, salt, and pepper. In another dish, lightly beat together eggs, garlic and parsley. Dredge (coat) each chicken breast in the egg mixture and then through the flour mixture. Set aside on a plate until all the chicken is coated. Heat a sauté pan over medium heat with the oil. Cook each chicken breast 6-10 minutes on each side making sure not to burn. The coating should be golden brown and the chicken should reach an internal temperature of 165 degrees.